Recently Deeper was exhibiting at two greatest Australian marine innovation shows – AFTA trade show and Sydney International Boat Show. For both events Deeper was teaming up with their best Australian counterparts – Rapala and Hunts Marine. 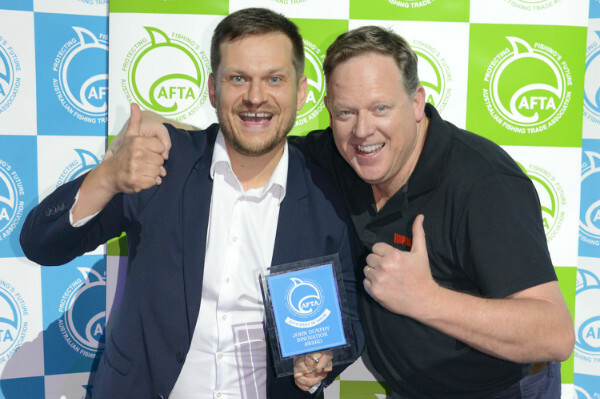 The Australia’s only official trade show solely dedicated to fishing, AFTA is a huge marine business event that has brought a great success for Deeper team. Deeper Smart Sonar PRO was a runner up in a category of Best Marine Electronics and became a highly commended product of the show. Whereas Deeper Smart Sonar PRO+ earned the most honourable John Dunphy Award for Innovation. Mr. John Dunphy is a respectable figure in Australian fishing community. A passionate fisher himself Mr. John Dunphy was a leading person of recreational fishing – he ran a highly successful tackle business and was a long standing president of the Australian Fishing Trade Association. This award demonstrates a major approval for Deeper innovative technology as well as grants the whole company with a responsibility for further Deeper brand development. Sydney Boat Show on the other hand is the largest recreational marine event in the Southern Hemisphere, where Deeper had a significant opportunity to participate together with a respectful marine goods retailer “Hunts Marine”. At the event Deeper received sympathies and a positive feedback about the great value product brings to its users. Our week long visit to Australia was a real sensation filled with great emotions winning the honourable John Dunphy Award for Innovation and establishing prospective business deals. Thank you Australia!